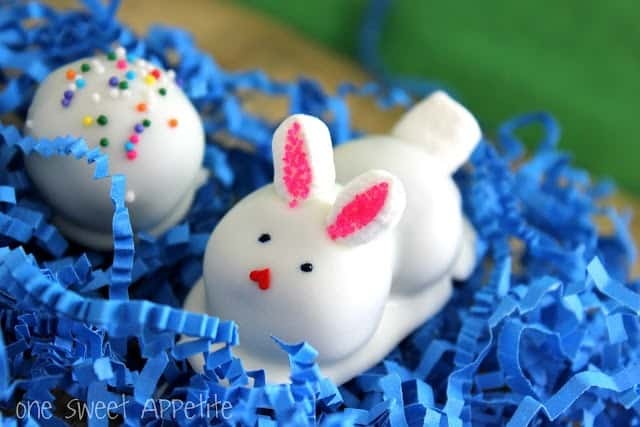 These Oreo bunny truffles are a fun and festive way to celebrate Easter! Made with Oreo cookies, cream cheese, and white chocolate – It is the perfect Easter dessert recipe! If you have followed along for a while you will know that I have a soft spot for adorable holiday treats. These Bunny Truffles are no different. I whipped them up my very first year of blogging and to this day they are still one of my favorites. I have made them on TV several times and taught local classes to help people master the art of the truffle. But I am here to tell you that this Easter recipe is super simple. So simple that I am confident you can do it too. 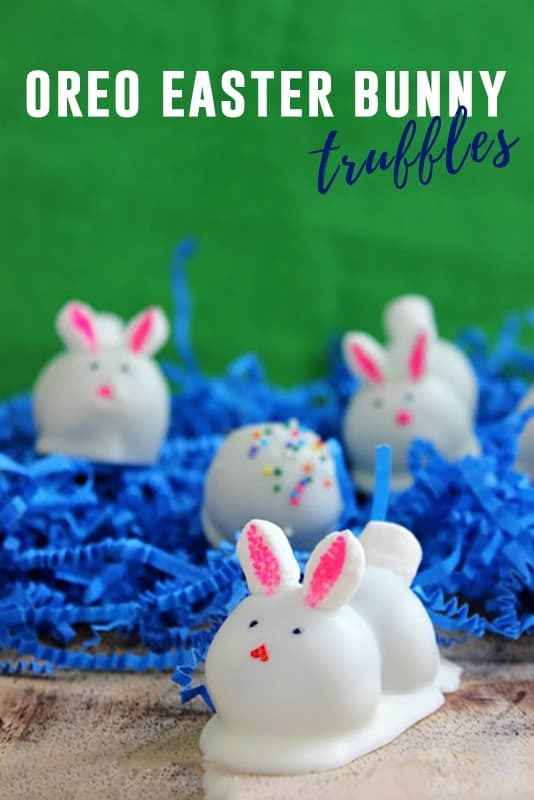 Follow this step by step bunny truffle tutorial and make your very own! Here is what you will need to get started on these fun little creatures! We are going to start with a classic Oreo truffle recipe. This will be the base of your bunny! 1 bag of Oreo cookies and 1 8oz package of cream cheese. 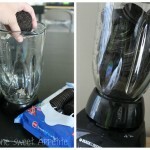 Place your cookies into a blender and pulse until they become a crumbled powder type texture. If you have a high powered blender or food processor, you can add the cream cheese right in with the cookies and blend until smooth. However, most of us will need to use a mixing bowl and electric mixer. Using an electric mixer, combine your Oreo crumbs with your cream cheese and whisk until a dough is formed. Use a small cookie scoop to form uniform size balls. Place them onto a wax paper lined cookie sheet and refrigerate them while we prep the next steps. Ideally, you could get this done right after you put your truffles in the fridge to firm up. 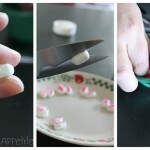 Take a mini marshmallow and squeeze it between your fingers to flatten a bit. Cut it in half with clean scissors and dip the cut sticky part into your sanding sugar. 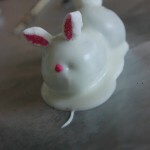 This will give you two bunny ears – ready to attach to your truffles. Keep going until you have enough for all of your bunnies. Dipping these can be tricky. Push two truffles onto a toothpick. You do NOT want to push the toothpick all the way through the second truffle like pictured above. Holding the toothpick, quickly dip your truffles into your melted almond bark. Let the candy coating drizzle off a bit and place on the wax paper. Working quickly- attach the ears, nose, and tail. Once the candy coating has dried use a toothpick and food color to add eyes. Gently pull out the toothpick. Dab a bit of melted chocolate onto a mini marshmallow and place on the hole creating a bunny tail. Just like that you have adorable bunny treats ready to share! 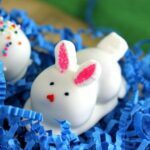 These Oreo bunny truffles are a fun and festive way to celebrate Easter! Made with Oreo cookies, cream cheese, and white chocolate - It is the perfect Easter dessert recipe! Roll your dough into evenly sized balls. Chill for 1 hour or until firm. While your truffles are chilling, make the bunny ears. Take one mini marshmallow. Slightly smush between two fingers. Cut with clean kitchen scissors directly in half. Take the stick side of the marshmallow and dip into the pink sanding sugar. Set aside. Melt the almond bark or white chocolate according to the package. Pull the truffles, four at a time, out of the refrigerator. Push a toothpick through two of the truffles. Make sure it does not go all the way through and only just holds them together. You will want a good amount still hanging out of the back to help you grip. Holding the toothpick, quickly dip your truffles into your melted almond bark. Let the candy coating drizzle off a bit. Place on the wax paper. Working quickly, place two ears onto the top of the head of the bunny along with an upside down heart sprinkle. Allow to set completely. Once the chocolate has hardened, gently remove the toothpick. Dip a mini marshmallow in melted chocolate and place over the hole the toothpick left. This will be your tail. Using a clean toothpick, dip into the blue food coloring. Carefully dot two eyes. Store your adorable bunnies in the refrigerator until ready to serve. Wow! I was not a follower last year and never saw these but I LOVE these! I can’t wait to make these. SO creative!! 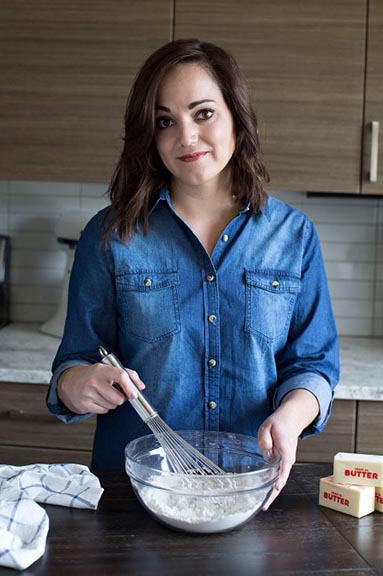 Did you use the whole container of oreos and bar of cream cheese for one batch? How many bunnies / servings did it yield overall? These are adorable and I’d love to do them for a family gathering. you have to manually code with HTML. I’m starting a blog soon but have no coding knowledge so I wanted to get advice from someone with experience. Any help would be enormously appreciated! What a Cute way to make truffles. How about a bit of marshmallow for that bunny tail? Hey there! These look adorable and I really want to make them this Easter. Just to re-ask Marys question: Did you use the whole container of oreos and bar of cream cheese for one batch? How many bunnies / servings did it yield overall? I did use the entire bag of oreos as well as one 8oz package of cream cheese. I ended up with 18 bunnies and 12 truffles. Love these! Remind me of my snowmen oreo truffles, but the spring version! Too cute. I did fine making these until it came to the almond bark, my truffles slipped off and the almond bark wasn’t all that runny, when I turned up the heat it started to brown :/ so that didn’t work either. Maybe I should have frozen the truffles. This improves the quality of life for many people who suffer with the sometimes debilitafing effects of arthritis. to get ejough to meet our bodies’ goals. Wow that was unusual. I just wrote an extremely long comment but after I cliked submit my coimment didn’t show up. Grrrr… well I’m nott writing all tthat over again. These are super cute! Think I will make them tonight. I am in most cases to blogging and that i reallyappreciate your articles. This great article has really peaks my interest.My goal is to bookmark your web blog and keep checking for brand new details. Can these be made ahead? If so how far in advance? yes, I would say keep them no longer than a week in the fridge. The marshmallow ears won’t be as fresh. Can you make these little guys with blue ears instead? Would they look okay with blue sugar instead of pink for their little ears? These are so adorable! Do these have to be refrigerated? I’d like to make and ship them. Will they be ok being shipped and not refrigerated? Do you think they are too fragile? I’m not sure that they would handle well with shipping but I haven’t tried it out for myself. what did you use the blue color for, the grass?